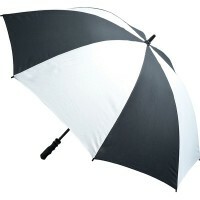 30inch storm proof umbrella with fibreglass shaft and ribs. Rubberised sports grip handle. Soft feel polypongee canopy. Open size 1300mm wide x 975mm high.